Laura, from Decor to Adore has been doing a weekly focus on the Royal Wedding, coming to a television station near you on April 29. Her posts are fascinating glimpses into facets of royal life and procedure. She's hosting a blogging tea party today. If you pop over to her site you'll find links to all sorts of wonderful tea parties taking place all over blogland. I'd like to invite you to tea chez moi. I've set the table with English bone china, from Paragon in the Romance design. When I was about 15, my mother, my sister and I were downtown and spied a wonderful collection of teacups. That day, mom told my sister and I to each pick out a pattern. This was mine and I've loved ever since. Unfortunately it ceased production quite soon and my pieces are limited. All the pieces I do have - salad plates, tea pot, cream, sugar, tea cups and saucers were gifts from my mother and mother-in-law. All the pieces but one. A friend gave us a cake plate for our wedding. In keeping with the royal theme, here's the back of the plate showing the coveted "By appointment to H.M. the Queen" warrant on the back. "Royal warrants are a mark of recognition to individuals or companies who have supplied goods or services for at least five years to H.M. the Queen, HRH the Duke of Edinburgh or HRH the Prince of Wales. Warrants have always been regarded as demonstrating excellence and quality and are highly prized." There are about 850 royal warrants. Around the time of our marriage I also chose this crystal pattern. I found it at the Hudson Bay Company. It's name is, fittingly, Prince Charles, however I do not know who made it. And like the china, production ceased soon after I started collecting it. Since the tea is partially to celebrate the upcoming nuptials, I thought it fitting to place a piece of romantic sheet music under the place. The linen napkins are vintage, over 50 years old, and a wedding gift to my in-laws. There is small tablecloth to match. I love thinking about the history of linens and dishes and of all the people who have sat around tables enjoying food, conversation, and laughter. Let's keep the centerpiece simple - a bouquet of pink roses, in a crystal vase given to me by my husband on our second wedding anniversary. Softly textured roses glowing in the sunshine are the prettiest things. For a little light entertainment, let's play a word search with all the words having to do with the wedding. It's often common, around these kind of celebrations, to look at the past and ooh and aah over the bride and groom. I have no photos of the bride's past, but a book of the groom's. Here is William's mother, Princess Diana, beautiful and glowing. William going home from the hospital with his parents. And of course, there must be good things to eat. How about blueberry scones? This raspberry meringue roulade is delectable, and there's plenty for seconds. Or some cucumber radish nibbles? For tea, let's be sure to have something English, like Twining's Earl Grey. Twining's also holds a royal warrant. Crystal servers for sugar and milk (not cream and NEVER the powdered chemical stuff) for those who want it. The best part of this tea table would be the conversation. How fun would that be! Be sure to check out the links at Decor to Adore. Lorrie, that was beautiful. I wish I could stop by and join your tea party! Such a pretty design, your china. It is sad when they stop producing a design, but occasionally you can find pieces on Ebay or Chinamatch. I enjoyed your tea time story Lorrie. The sheet music is a nice decorative touch. I was given the same book. Who could ever forget that wonderful picture of William coming home from the hospital? 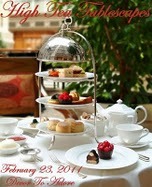 Perhaps your post will inspire some of us to invite some friends to tea in April. I'd love to come. That's what I meant by creating beautiful moments. Enjoy. What a pretty table! I think I'd enjoy a tea party right about now. It's snowing heavily down here - how about where you are? Ton service est vraiment très délicat et élégant ! J'adorerais venir pour le thé... mais j'ai du ménage à faire, les filles reviennent dans quelque heures et il faut que je finisse avant ça ! Ah, le mariage royal... ça va alimenter pas mal d'heures de cours prochainement ! Hi Lorrie! thanks for the early morning tea party! You would have been a wonderful guest at That Country Place Tea Room when I was operating it ( now we are completely BnB), we hosted many Mother's Day, Little Miss, High Tea, parties to name a few. It is fun to set a pretty table and to enjoy it with friends. Have a great day. Oh you didn't! Now I'll have to go fix all of mine. Your china is gorgeous! I love how you have set your table. Beautiful and inviting. oh my, this is so romantic with the tender decorated plates and the music sheets of Liszt's Liebestraum. You made a wonderful table and the food looks so delicious. I really enjoyed to have a look at this fantastic table before the Royals will enjoy it. Oh my goodness I am overcome with all of the loveliness! Your table setting is just spectacular. Your lace tablecloth is just gorgeous! I adore the vintage napkins and their history. How sweet you have such a wonderful book. I love the extra special touch of the word search. Your table setting is beyond incredible. Stunning. I love your treasures. Think of me, nose to grindstone while you are sipping that tea. What a lovely tea party...down to the last detail! What treasures...and sweet touches (like the sheet music). Thanks for inviting me to your most royal high tea! I'll come to tea at your house any time! :-) Beautiful! The sheet music is a clever touch! I love the setting! Mmmm such a lovely tea party! When my girls were young they would invite their friends over for tea parties. I would let them use my china (tea cups and all) much to their pleasure. Not one of them ever got broken or chipped! Glad to see that there are still some Royalists out in the colonies! Your teatable is a delight, I'm sure Queen Kate would love it. I love that you use your family linens! They're beautiful -- as are your china and crystal. The sheet music adds a nice unexpected touch to your tablescape. Thanks for sharing! Everything looks so beautiful! your china is gorgeous and the foods looks yummy! I spotted in one of your pictures a blue egg plate. I love it! Thank you for letting me join you for tea today! What a special memory of picking your china pattern! Lovely table setting. I'm thinking about having a royal wedding watching party so I'm glad for the hook up of all the ideas. Unfortunately I am not formal at all so I'll have to figure out how to causal it (or dumb it) down to my level. Thanks for the tea, conversation, beauty and fun! Love the sheet music as chargers. Your dishes are so pretty. Oh Laurie! Soooo pretty! Your pictures are a bright spot in my busy day. I'll stop for a cuppa and think of you! LOrrie, This was not only a romantic tea party but a happy stroll down memory lane! I love your china pattern. You have displayed it so beautifully! And the romantic sheet music as placemats is brilliant. The china is pretty and delicate. Shows how quickly time passes when it does not seem that long since Prince Charles married and now has come the time for his son.